4 Steps That Will Help You Find a Good Move in Almost Any Chess Position! You are here: Home / 4 Steps That Will Help You Find a Good Move in Almost Any Chess Position! Important note: This article gives you an overview of the important things you should be thinking about when you want to find good moves in your chess games. Imagine how much your chess would improve if you could rely on a simple method which would help you think and find a good move from almost any position! In this article I will show you the 4 steps you should follow if you want to consistently find great moves and avoid blunders at the same time. The purpose of step 1: Determine where your focus should be. Determining the needs of the position will help you apply your (limited) mental energy in the most effective and efficient manner – by focusing your attention on the items which are most relevant to the current situation. The time you spend thinking about the position on the board will not be productive if you don’t know what to think about. Have you ever found yourself staring at the board for a few minutes – secretly hoping the right move would suddenly come to mind? This happens when you’re not sure what to think about and I believe this is a fundamental problem all chess players face. Once you solve this, your thinking time will be more productive. There are so many questions you can ask yourself but the key is knowing which ones are most relevant, given the situation on the board. A checklist of questions is not practical. Instead, you should be guided by a logical thinking method. The questions I present here are the primary questions you should ask yourself and from there new question will arise in a logical manner. This is essentially why determining the need of the position should be the first step in your thinking method. What is my opponent threatening? Do I have any new opportunities as a consequence of my opponent’s last move? What are my most logical objectives in this position? Chess players intuitively know that danger lurks around every corner. This can make you very uncomfortable during a match and can even cloud your thinking. Only once you feel confident that you are aware of all the threats that exist in the position, will you be able to think calmly and clearly about the position. The consequences of your opponent’s last move represent new information about the position. What are the downsides of their last move? Maybe the move is a mistake? The better you understand the consequences of their move, the better you will understand how to take advantage of it too. Furthermore, you don’t want to calculate every move from scratch and you don’t want to find a new plan after each and every move. Instead, you want to understand how the last move affects all your previous calculations and plans. If your opponent has no serious threats that you must deal with, then your objectives will depend primarily on the stage of the game. For example, in the opening you will focus on developing your pieces and getting your king safe. In the middle-game you want to further improve your position whilst at the same time planning an attack against your opponent. In the endgame, one of your primary objectives will be to create a passed pawn, not only because you want to promote the pawn but also because a passed pawn will tie up your opponent’s pieces by forcing them to keep an eye on the passed pawn. The purpose of step 2: Check to see if an ideal move exists. There are a number of benefits if you can improve your position by force. Not only would your position improve, but at the same time your opponent won’t get an undeserved opportunity to improve their position. This is enough reason to play the move and conserve your mental energy. Where are the pressure-points (targets) in my opponent’s position? Can I use a check, capture or threat to achieve any of my objectives? A pressure point is a piece, a square or an area on the chessboard where you can add pressure on your opponent. Pressure points are important because you can often use them to make tempo moves and to make progress whilst at the same time forcing your opponent to defend. If there is a forcing way to improve your position, then you should do it. Think about it this way – if a move exists that improves your position and forces your opponent to make a move that doesn’t improve their position, why shouldn’t you do it right away? You should! Such moves are called tempo-moves and you should take advantage of them whenever you can. But be careful. A move that makes a threat but at the same time weakens your position is not a true tempo-move. If you can improve your position by force, then you should do it. Again, you shouldn’t waste your time and energy considering other moves when there is an obvious way to improve your position. The purpose of step 3: Maximize your chances of finding an optimal move. To further conserve your mental energy, you should intuitively discard moves that don’t serve your objectives. But at the same time you shouldn’t overlook a move that could potentially be the best move in the position. Furthermore, by comparing various options you increase your chances of finding an optimal move. If you don’t face any serious threats and if you couldn’t find a forcing way to make any progress towards your objectives, then you should shift your attention to candidate moves that can help you achieve strategic objectives. Which candidate moves have the potential to serve my objectives? Which candidate move will maximize progress towards my objectives? In order to identify candidate moves you need to understand how to evaluate a position, because the evaluation process will provide the information you need in order to find plausible candidate moves. As with any decision-making process, the output quality is largely determined by the input quality. In chess, this input refers to your awareness and understanding all the important factors that influence the position. A stronger player will thus be able to generate better input than a weaker players would. This is also why top players rely so much on their positional understanding. I will show you the 5 most important factors that you should be able to evaluate. The key here is to, first of all, understand your objectives. When you understand your objectives you will also be able to evaluate whether or not your intended move helps you achieve your objectives. The best option is often a move that helps you achieve your objectives whilst at the same time restricting your opponent’s options. The purpose of step 4: Avoid blunders and to be sure your move actually makes progress. Can my opponent exploit the downsides of my move? How permanent are the consequences of my intended move? It is possible to think about the advantages of your moves and completely forget about the downsides. Before you go ahead and play your move, think about the downsides of the move. Am I leaving a piece or important square undefended? Can my opponent exploit my move by tactical means? You should be careful when considering such moves since their consequences cannot be undone! Does the advantages of your move outweigh the disadvantages? If you considered these important points and you are satisfied your move is not a mistake, go ahead and play the move. You may be surprised at what I am about to say, but please hear me out. I do not recommend that you rigidly use this 4-step thinking system in important club or tournament games right away. This is because you may not have enough time to go through this thinking process on every move and you may quickly become mentally fatigued. Instead, you should use it as a training method until you’ve become so comfortable with it that applying the steps becomes like a second nature and you can do it easily in all your games. A well-trained thinking process is a competitive chess player’s most reliable weapon because it serves as the foundation on which your tactical skills and positional understanding can be build on. Thanks for reading, feel free to share your thoughts on this article in the comments below. Want to further improve your chess skills? Thank you so much Louis.I pour over the classics each night and when I return(always joyfully I might add!) to your fantastic website it is so much easier than trying to decode the old descriptive notation from the old masters. I really just love chess and as a very new player I feel very confident from your coaching. The very best to you! Thank you, Barry! Have you tried the 10-Day Chess Challenge? Some examples of step 3 would be helpful for me. That is, how to generate moves that make progress towards the 5 objectives. I intend making a few videos soon where I will give a few examples of how to generate moves. It mostly has to do with checking out all the moves that make progress. This of course requires an understanding of your objectives, which then helps you find candidate moves intuitively. The time and effort that you put into writing this and all your other articles is very much appreciated. Thank you, I appreciate your comment too. As always your advice is most helpful. each point. Just a suggestion. Thank you for the suggestion. 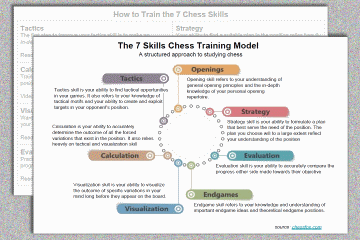 I have in mind to make a few videos that will cover this chess thinking method too. i agree it is a great advice but to go through these steps every move in a (realtime) game i feel it is too difficult. In one or another way it has to be shorter to be practical in my humble opinion. Grreat advice. Players of all standards can benefit from integrating this training into their game.